The Lyndongraey Kennel had a quite year this year but unfortunately it did not start well as we had to say goodbye to our lovely Darcey, who died very unexpectedly on 9 January. We know that she is happy and waiting for us at Rainbow Bridge with the rest of our Lyndongraey family. 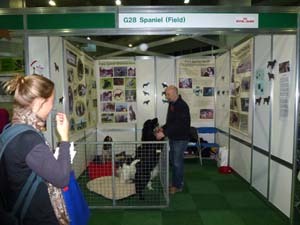 We once again represented the Field Spaniels in the Discover Dogs section at the first London Pet Show at Olympia on 7 & 8 May 2011, where the breed was very well received. 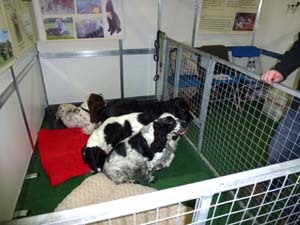 Then in November we attended Discover Dogs to man the Field Spaniel Booth on the Saturday, we took Sebastian, his brother Archie, Topaz and her son, Forrest all the dogs again seemed to enjoy their day out. 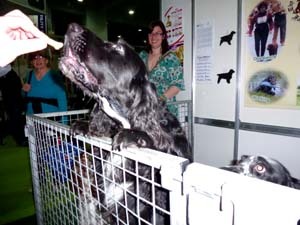 Ray and I represented the Field Spaniels at Discover Dogs on 12 November 2011, with my brother, Stuart joining later in the day, he owns Archie who was very pleased to see him. 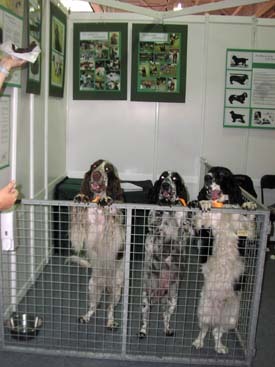 With only 31 puppies registered in 2011 we really need to represent our very lovely breed, as the Field Spaniel is classed as vulnerable by the Kennel Club we need every opportunity to show them off. 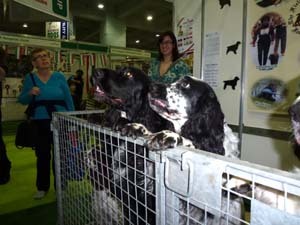 The question we were asked the most was what is the difference between an English Springer Spaniel and a Field Spaniel? and why haven't we heard of this breed before? If you would like to know more please get in touch? 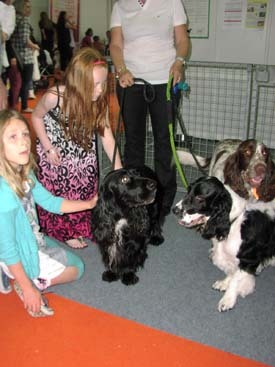 We were very busy on Saturday and spoke to some lovely people who think their next dog will be a Field Spaniel. I just hope they are able to find one before this breed disappears for good. 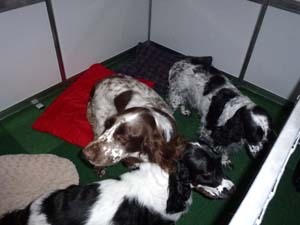 We took 2 blue roans, Sebastian and Topaz, a liver roan, Forrest and a black called Archie. I believe Ruth had a good day on the Sunday. 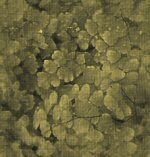 Below is a selection of photos we took. 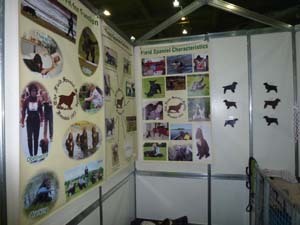 Once again we represented the Field Spaniels in the Discover Dogs section at The London Pet Show at Olympia on 7 & 8 May 2011. 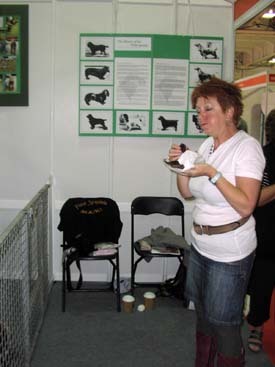 This was the first London Pet Show which was very well received and I believe the organisers are already thinking about organising a bigger show next year. 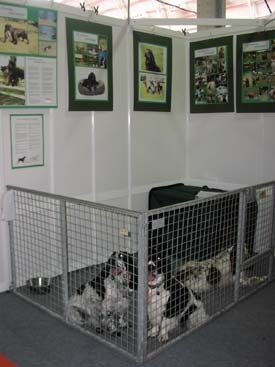 We were very fortunate to be given a stand to represent our very lovely breed, as the Field Spaniel is classed as vulnerable we need every opportunity to show them off. 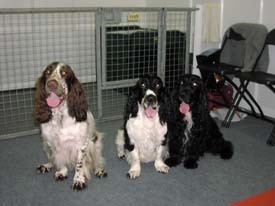 The questions we were asked the most was what is the difference between a Cocker Spaniel and an English Springer Spaniel? and why haven't we heard of this breed before? 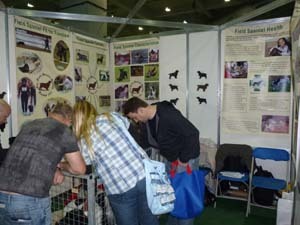 We were very busy all weekend and spoke to some lovely people who think their next dog will be a Field Spaniel. 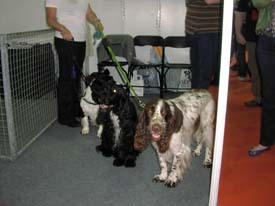 We took on Saturday 2 blue roans, Sebastian and Topaz and a liver roan, Forrest. Sunday we had a solid black, called Archie. 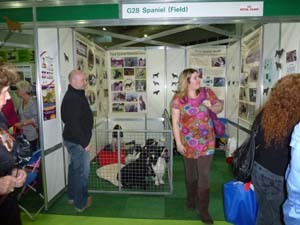 All the dogs were excellent and enjoyed all their cuddles. Below is a selection of photos of the weekend. Sue having a well earned bit of lunch ! !